Veterans serve in natural disasters with "gauze and goodwill"
Many of the 2.5 million veterans returning home from serving overseas in Iraq or Afghanistan have a strong desire to continue to serve. While they're happy to be home, high unemployment rates can be demoralizing, and some veterans feel the need to find a new mission and purpose in life. "People joined the military because they wanted to serve, they wanted to be part of something bigger than themselves," says Matt Pelak, Director of Strategic Partnerships for Team Rubicon. Team Rubicon is an American non-governmental organization founded by retired U.S. Marines William McNulty and Jacob Wood in the aftermath of the Haiti earthquake in 2010. 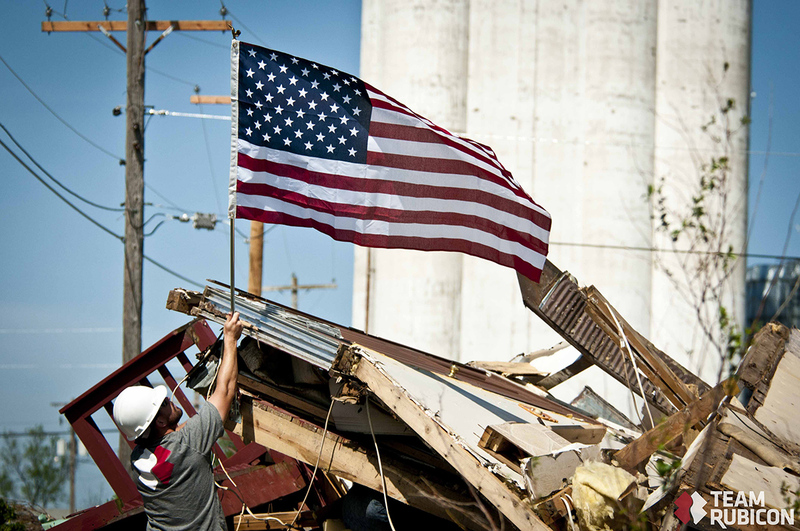 The organization deploys volunteer teams of military veterans as first responders in the wake of natural disasters. Continuing to serve, help people, and put their military and emergency medical training to use allows veterans to heal their own broken spirits. "They're members of a team again, they have another shared misery experience that really binds people together. It's just that this time it's not with guns and grenades, it's with gauze and goodwill," McNulty told CBSNews. McNulty says that in addition to finding jobs and integrating back into everyday life, "One of biggest challenges for our returning veterans is to find that new sense of purpose. What's that new mission?" That's especially tough for those who have struggled to find steady work. In October, the average unemployment rate in America was at 5.8 percent, but the figure for post-9/11 veterans remains much higher, at 7.2 percent. With the skills that they developed in the military, veterans are uniquely qualified to assist in the immediate aftermath of natural disasters. The mission of Team Rubicon is to "bridge the gap" between whenever a disaster strikes and the amount of time it takes for traditional aid organizations to arrive. Pelak has 17 years of experience as an infantryman and firefighter and paramedic. He says with Team Rubicon he can leverage the skills he gained from working with the infantry and his emergency services background, offering medical care, leading teams, decision-making, and building the organization. Pelak witnessed the horrors of war when he was deployed three times to Iraq and Afghanistan. He says being involved with Team Rubicon has given him back a sense of mission, and he's pleased he can use his experience to help others and make a difference. "It makes it easier to sleep at night," Pelak says. McNulty adds that one major challenge for post-9/11 veterans was returning home without a real sense of what they had accomplished, what they had sacrificed for. "Identifying progress is something that was very difficult for veterans over the last 10 years in Iraq and Afghanistan," says McNulty. McNulty says that's why disaster response is so healing for veterans, because "it's tangible. Whether you're tarping someone's house after a tornado just ripped off the roof or you're saving the life of a child in Port au Prince after an earthquake, progress is tangible. You can see it." In the aftermath of Hurricane Sandy, Team Rubicon deployed over 350 members and managed over 10,000 spontaneous unaffiliated volunteers to help clean up the destruction and provide life-saving medical assistance. They used smartphones loaded with technology developed by Palantir Technologies to record and track their efforts. Over the course of the mission, Palantir estimated that Team Rubicon's assistance helped save the state of New York about $3.7 million in disaster recovery costs. With over 18,000 volunteers, Team Rubicon has conducted 70 missions around the world. They have developed a national response strategy for anything from an earthquake to a tornado or a hurricane. President Barack Obama and First Lady Michelle Obama have both honored Team Rubicon's global efforts in past Veteran's Day speeches. McNulty says they are planning to expand the organization to include military veterans from allied countries who fought alongside the U.S. as part of the multinational coalition in Iraq and Afghanistan. To support Team Rubicon or to learn more about the organization, visit teamrubiconusa.org.